A weekend saga in two parts. Part One: Saturday 7 AM. We were lying in bed and the dogs were going totally beserk. Woof, woof, bark, bark, bark. Calling them did no good. Commanding them to "come" just resulted in more urgent barking so Steven went down to see what was causing all the commotion. Then he yelled to me "There's a raccoon just outside the window". I ran downstairs and there it was, lying on the path outside the dining room window. 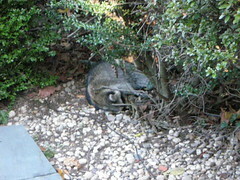 Raccoons shouldn't be out in daytime, and they shouldn't be stretched out on the doorstep at any time of day. I wasn't sure if it was alive or dead but I had to get dressed before I could rationally assess the situation. We've had reports of rabid raccoons in the county, so if we see any raccoons behaving out of character we're supposed to call someone. Only we couldn't remember who. So while I went off to shower and dress Steven called 411 and asked for animal control. Turns out a raccoon is not an animal, it's wildlife and we needed to call the police. More interesting still is that the Village has a wildlife expert, who used to be the Police Commissioner. But she'd caught a raccoon the day before and had left her raccoon-snatching gear at the vet's so she couldn't be at our house for a couple of hours. We had to be out in less than an hour to attend 6 hours of defensive driving tuition to get 10% off our auto insurance. (And with the number of fender-benders Steven had last year, we need it!). 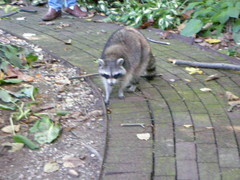 We were just going to have to trust the police would be able to find the raccoon without our help. They told us to get a garbage can and put it over the raccoon and they'd deal with it. But when Steven approached it the (we thought) dying animal with the bin it sprung to life and climbed 10' up the maple tree. 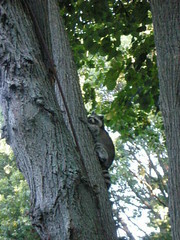 There was nothing else we could do at that point so we locked all our pets in the house and headed off to the course hoping that the wildlife expert would see the raccoon up the tree and capture it. When we got home there was no sign of it, just some scuff marks around the tree, so Steven took the trash can away and we thought the drama was over. The dogs started barking again but this time at something in the back yard. 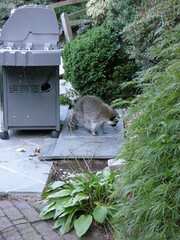 Even in the dawn light we could see that the raccoon had made his way to the barbecue and was standing there shaking. 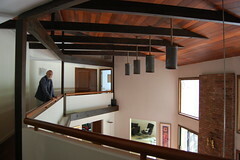 This is where things took on a cartoonish quality. 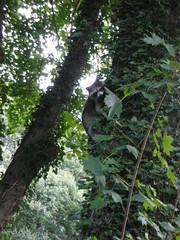 Steven went out to look at it, the dogs rushed past him to get to the raccoon and once again the raccoon came to life and shot up the linden tree. After a while the poor thing fell off the tree and staggered around some more. At one point he fell into the pond, but he managed to climb out again. Every so often he'd fall over and shake. It was really horrible and the wildlife expert promised she'd come and get it but we needed to watch it in the meantime. And I watched it lying down. Eventually the wildlife expert aka a neighbourhood volunteer turned up with her raccoon catching gear: a pink cat carrier, a garden shovel and a noose made of plastic line. That was it. No boots, no gloves, no protective gear or special equipment whatsoever. Nothing to prevent her from getting rabies should the animal bite. I felt like a complete wimp at this point. The came the fun part. Herding a wild animal into the cage with limited equipment. Rocky proved very recalcitrant for a sick raccoon and our neighbour decided she needed to go to the police station to get a noose on a long pole so we could trap him. 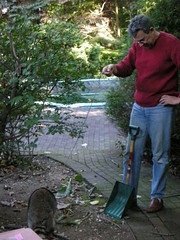 While she was gone, however, Steven decided to have a go and managed to get the line around the raccoon's neck. Then he sent me off to find the expert and get her to help put him into the cage. 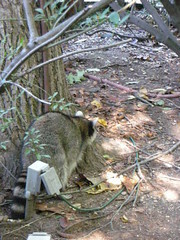 But by the time we got back he had the raccoon in the carrier and the excitement was over. My hero. The raccoon will be taken to vet and monitored for distemper and rabies. If it can be treated it will be and then it will be released.